Scalp Micro Pigmentation (also known as SMP) is a procedure wherein patients with thinning hair have ink tattooed into their skin to make it appear thicker and fuller. This procedure is very similar to regular tattoos but there are some variations in how it is performed. At DermMedica we have come across numerous patients unsatisfied with the results. We’re happy to tell you that this doesn’t have to be a permanent problem. 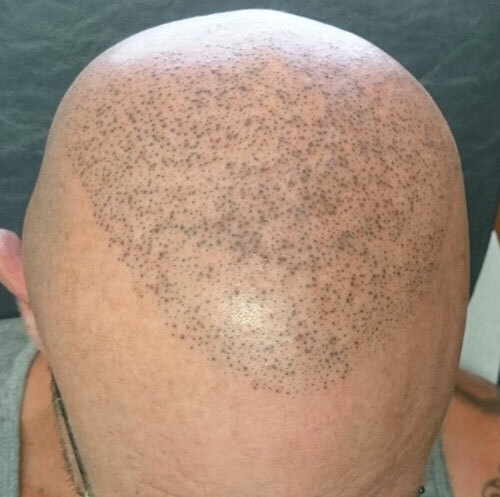 Below is a photo of a typical scalp micro-pigmentation patient. These are very nicely treated with our tattoo removal lasers. We have seen numerous patients who have undergone SMP and wish to have the ink removed because it looks unnatural. Most patients find that SMP works better and looks better on darker skin types because the natural skin colour helps blend in the in more naturally when looking at it from a distance. Those people with lighter or fairer skin usually find the cosmetic results unacceptable and often choose to have it removed using lasers. How do you remove SMP? The advantage of having SMP removed with our Gold Standard Q-Switched lasers is that because there is usually less ink deposited in the skin, fewer treatments are required. 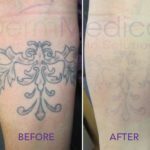 This is normally the case for most patients but of course, individual situations will vary and we cannot give an exact number of treatments needed for complete removal as each tattoo responds differently to laser therapy. Prior to the SMP removal treatment, we apply an anesthetic cream to the affected area to increase patient comfort during the procedure. Some patients choose not to have the topical anesthetic and go straight ahead into treatment. We leave this choice to our patients to decide as some people don’t find the tattoo or laser removal process uncomfortable. After treatment, we apply an ointment to the affected area and give instructions to our patients on how to care for the treated skin. We normally recommend eight weeks between treatment sessions to allow for full healing and a reduction in the tattoo ink visibility. We cease treatments when the patient is satisfied with the result, and again, we can’t make any guarantees as to how many treatments are required but we do our best to treat maximally each session. 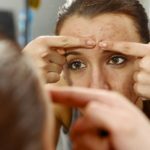 Pricing for each treatment varies between patients so at DermMedica we encourage you to come in for a consultation prior to offering a complete quote. We also have our extreme removal option which will speed up the process and save you a great deal of time. Fore more information please contact our office, at DermMedica we’re committed to answering any and all of your questions regarding Scalp Micro Pigmentation. How much does SMP removal cost? The final cost will have to be determined after an appointment. Depending on how effectively your pigmentation was applied, or how large of a surface area it covers, your treatment may take require more sessions. How completely can scalp micropigmentation be removed? That can only be determined during a physical examination. Thanks to expert application and the latest technology, we have been able to produce great results for our SMP removal clients. You’ll get an honest assessment if you set an appointment and let us see your condition. A sensation is always to be expected when lasers are involved, but this one is considered very manageable. Many patients comfortably complete it without any anesthetic at all, but a numbing cream is available if you find the treatment uncomfortable.